Thanks to the recent arrival of Henry, Charlotte’s adorable little baby boy, we haven’t had much opportunity to move ahead with Alphabet Adventures. But Charlotte decided to make the best possible use of her maternity leave (during breaks from caring for Henry, of course!) by searching for a restaurant so that we could continue our adventures with the letter E. She decided that Ecuador would be a great next stop for us, and discovered a little Ecuadorian restaurant with good reviews in Holloway, my old stomping ground. 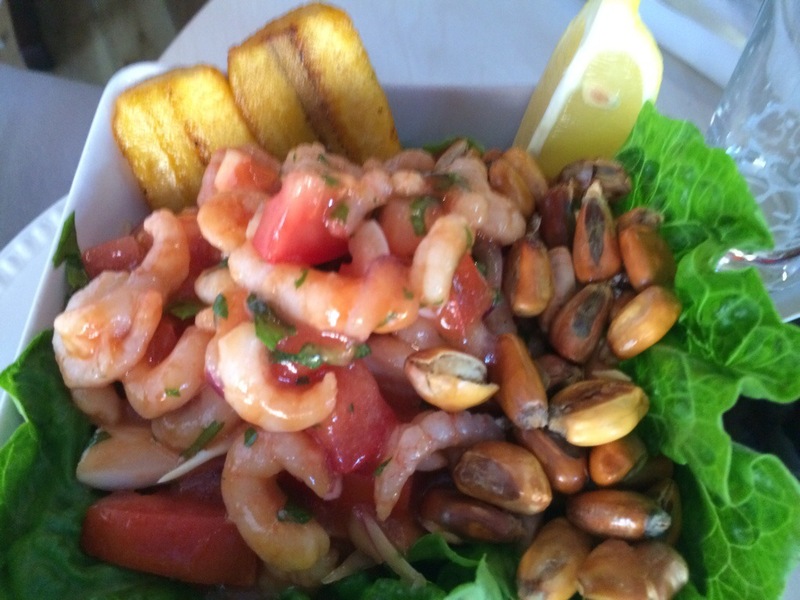 Ecuadorian cuisine is varied depending on the region, but generally includes meat, fish, rice, corn and plantain. In the mountain region of Ecuador, cuy (guinea pig) is typical. I felt it was quite safe to assume we wouldn’t be encountering deep-fried guinea pig in Holloway, and was relieved to be correct in that assumpion. El Rincon Quiteno doesn’t have a website, and I forgot to take photos of the menu, so I’m afraid you will have to make do with my descriptions of the dishes rather than the correct names. The restaurant (well, it’s pretty much a cafe) is just a few minutes walk from Holloway Road station and when we arrived, the tables outside were already full of regulars who were chatting in Spanish – and I assumed they were Ecuadorians, which I thought was a good sign as to the quality and authenticity of the food. Jo and I arrived first and settled ourselves down with thirst quenching soft drinks: I chose a sugary concoction which is apparently traditional to Ecuador. It looked like iced tea and tasted like caramel. Just as well I don’t remember the name, as it was quite addictive. When Charlotte arrived we spent quite a lot of time gassing, which meant the waiter had to come back several times before we had decided what to order. He was very friendly and accommodating though, and didn’t make us feel bad for ignoring the menu so that we could catch up with eachother. Eventually we chose our starters: chorizo tortilla for me, chicken empanada for Jo, and prawn cocktail for Charlotte. 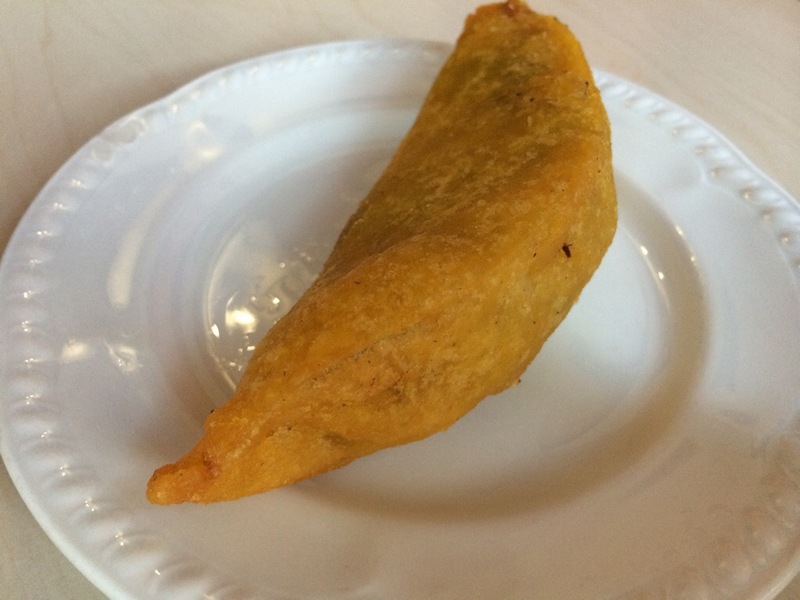 Jo’s empanada was tasty but disappointingly small, and she only received one. The tomato relish which came with it was spicy enough to burn off the roof of her mouth and she is a brave girl when it comes to chilli. 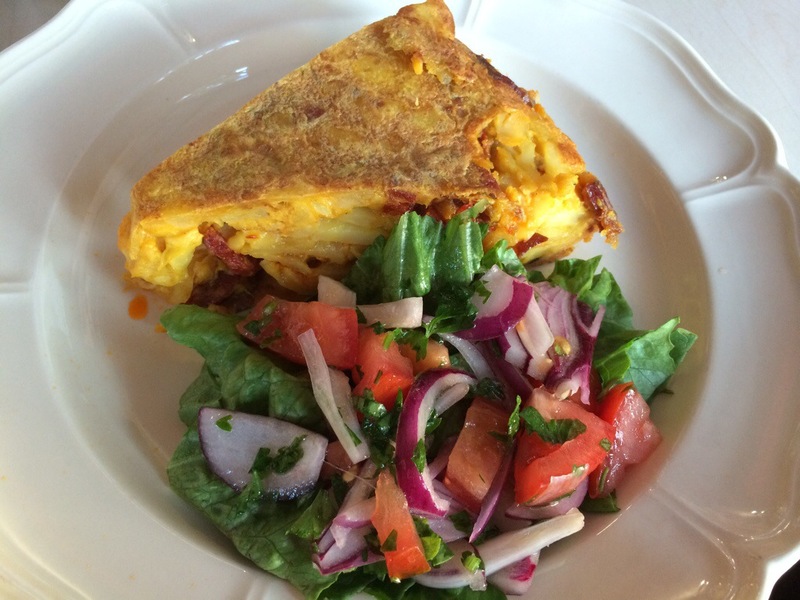 My tortilla was delicious – a huge wedge of Spanish-style omelette, with slices of spicy chorizo layered through it. But Charlotte’s prawn cocktail was the most interesting of the three starters: a huge bowl layered with salad and filled with prawns, fried plantain and fried corn. The dressing was not the mayonnaise base we were used to, and instead the prawns had a citrus and tomato dressing which was reminiscent of ceviche. 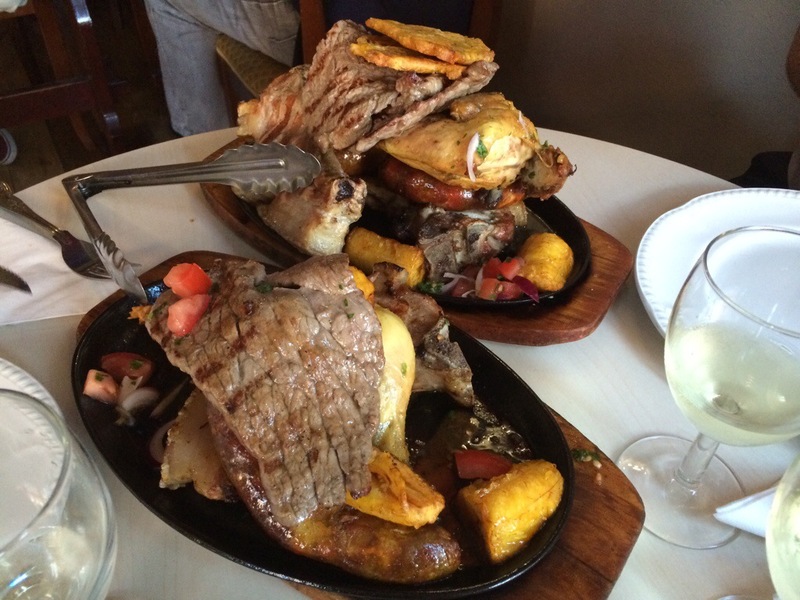 For our main course we decided to share a traditional Ecuadorian mixed grill which the waiter had recommended. Well, let me recommend to you that you don’t do the same unless you are starving hungry and craving meat. As we sat there, two sizzling trays of meat arrived, and we became immediately of interest to everyone in the restaurant, who couldn’t quite believed we had ordered such huge quantities of food! 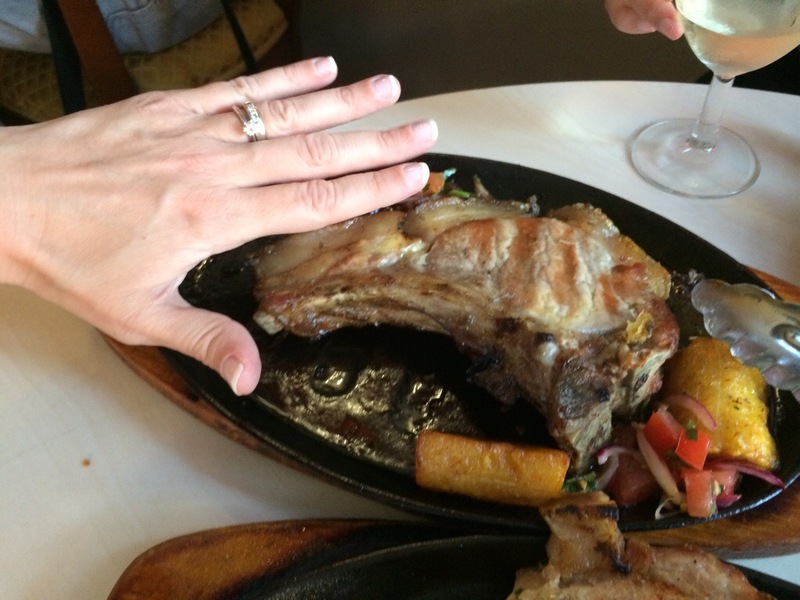 We each had a large steak, a humungous pork chop, a whole six inch (minimum) chorizo sausage, and half a chicken. I kid you not. There were also fried plantains on the plate and a few roasted tomatoes, but the veggies barely registered. Just as we were getting over the shock of all that food, the waiter brought another table aside our own so that he could serve the rest of the meal. Yep, there was still more to come. 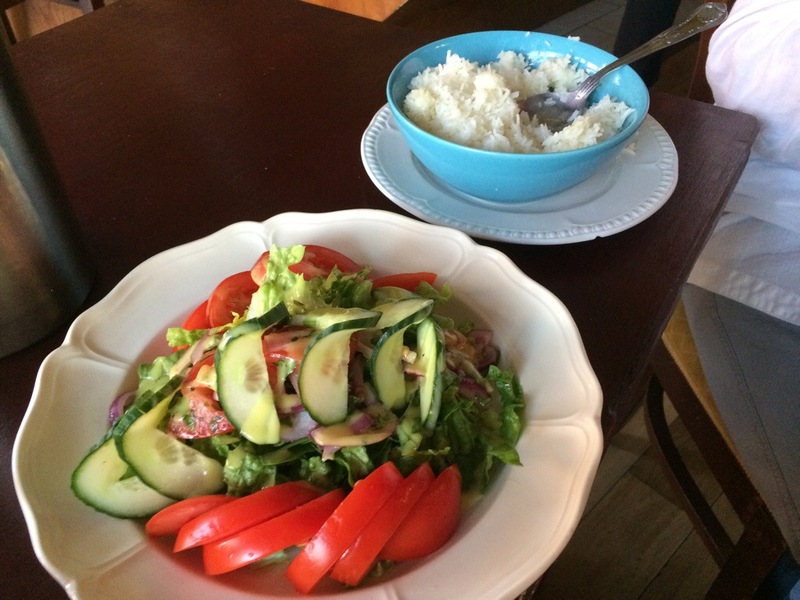 A bowl of rice big enough to feed six people and a large plate of salad. We looked at eachother in disbelief – none of us knowing where to start. I mean, we are all greedy girls with big appetites – in fact that’s probably one of the reasons why we are such great friends – but we had been served a serious amount of food – enough to feed six greedy people easily. We decided that the top would be best place to start, and each took a steak and some vegetables. Unfortunately, the removal of the steak exposed the sheer magnitude of what was left, and the monster pork chops sat there mocking us as we slowly cut through the steak. I dished out a spoonful of rice for each of us (which was all we managed all night) and we started our epic (Wo)man v food adventure. In all honesty we’d eaten enough after we finished the steak, but felt it was important to try a bit of everything. Jo and Charlotte started on their chicken, but I made the brave decision to crack on with the pork chop. Fortunately I discovered a thick layer of fat and rind on the chop, so along with the bone I was able to dispense with half of it simply by cutting off all the bits of the chop which I would not be eating anyway. We all tried a bit of our own chorizo sausage, and decided we wouldn’t need to try any more than one slice: it wasn’t the paprika-flavoured chorizo of Spain we were used to, but the flavours were of cumin and tumeric, and not really to our tastes. I forced myself to eat some of the plantain as well. Plantain is something I have always avoided as when raw they look like black, off bananas, and when cooked they look like mushy bananas. And I really cannot stand black or mushy bananas. But actually, the plantain tasted as inoffensive as Jo and Charlotte promised me it would, and whilst I wouldn’t go out of my way to have it again, I won’t automatically make gagging noises each time I see it on the menu in future (a point for future reference: waiters don’t like it when you do that). I scraped off the chicken skin and ate a sliver of chicken; followed that with a slice of cucumber and I was done! Each of us had managed to try a bit of every piece of meat, and we had also managed to force down a spoonful of each accompaniment. Success! Now I probably sound a bit negative about the experience, so don’t get me wrong – everything we were served was cooked well and was nice enough. However, each of the meats was just simply grilled, and when you have so much meat to eat you really need other flavours to help keep some interest in the food if you are going to be able to make decent inroads in working your way through the plate. Additionally, there was so much food on the plate that there was no way we’d be able to eat it all. I think even if our other halves had been with us they would not have been able to finish everything on the table. They probably would have relished the challenge more than us though! El Rincon Quiteno didn’t have any puddings to offer us, which is probably a good thing, so we had coffees and paid the bill (£90 for 2 mega courses each, soft drinks, beer and a bottle of wine), and slowly made our way back into the muggy evening (not brilliant when you are already suffering from meat sweats) for the tube journey home. I don’t think we’ll ever go back to El Rincon Quiteno unless we want to attempt another Man v Food challenge. However, if you like your meat, or are on an Atkins style diet, then definitely give it a go – you will get good value for your money, and friendly service, and some impressive photos of mountains of food. Next up we’re on to the letter F, and we’re thinking of going for a French feast, so if you have any recommendations for good French restaurants in London then please leave your ideas in the comments section below. You know you have to do Sierra Leonean food when it comes to S right? Let me know any restaurant tips. Sounds like a great idea!